Page loads are inconsistently loaded or timing out. Each httpd process stuck in G state shows the following stacktrace: https://phabricator.wikimedia.org/T182832#3940279. This seems to be due to how Phabricator handles very long json strings. Upgrade Phabricator to the next upstream release seems to be a possible solution due to some recent activity related to json string handling. httpd regularly segfaults during php_request_shutdown with the following stacktrace: https://phabricator.wikimedia.org/T182832#3947103. This is possibly not related to the above issue, but to https://bugs.php.net/bug.php?id=74702. Upgrade phab1001 to PHP-7.1 seems to be a possible solution. Duplicate None T186620 Phabricator down due to "Failed to `proc_open()`: proc_open() expects parameter 2 to be array"
T186620: Phabricator down due to "Failed to `proc_open()`: proc_open() expects parameter 2 to be array"
rPHAB893664bd44b8: EditEngine: 'Duplicate Form' action to create new forms from existing config. I didn't even mean to imply you have to rush it, just that it's not worth to upload a puppet change for like one more (weekly) restart that we can do manually. Definitely, I agree, plus I'd add a restart script only as last resort. Unfortunately, I can't explain why there are no more "G" processes, other than that it was restarted recently, maybe it takes longer for them to appear. I fixed the server status page. it's available again now. Ok so the upstream code is deployed, now we just wait and see if the situation improves. Feb 13 06:28:25 phab1001 diamond: Collector failed! The zend_mm_heap corrupted is new as far as I can remember, let's keep an eye on it. From a quick search seems related to opcache, but I am fairly ignorant about the subject. https://bugs.php.net/bug.php?id=65590 seems to be related. We could try turning it back off to see if zend_mm_heap corrupted goes away. I'm now convinced that the problem is a bug in php internals and our best bet is probably to switch to just about any newer version of php. That said, it is probably triggered by something sortof unusual that phabricator is doing in recent versions. Fixing it from the Phabricator side would really just be working around a php bug, however, I really don't know where to look for the trigger. Some people on stack overflow and the php bugtracker mentioned changing the size of php's output buffer. That might be worth looking into but it doesn't feel like a good way to fix segfaulting. @elukey what about backporting php7.1 from buster into wikimedia-stretch component/php71? I am running buster's php7.1 packages on phab-stretch.wmflabs.org and it works. @Paladox: how many packages from buster were required to get it working? @mmodell worth to open an upstream task about the issue? @mmodell "This is finally fixed in PHP-7.1 with "safe timeout handling." 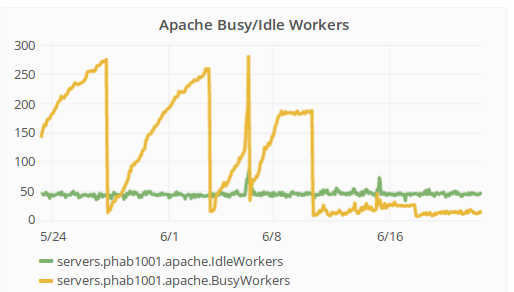 The result was that the server-status.conf was in conf-available where it was expected but because the apache module had put it there and there was no puppet code to purge it / it wasn't done manually. The symlink from conf-enabled to conf-available though was removed by puppet and it reloaded Apache, breaking the status page. That is a remnant from when it still used the Apache module but the httpd module doesn't have it on purpose because we want to remove the diamond collector. @Muehlenhoff hi, what about backporting php71 from either buster or https://packages.sury.org/php/pool/main/p/php7.1/ (buster php 7.1 works on stretch when i installed the debs manually). If it's really as simple as importing the packages from buster and deploying them, then that seems like a fairly ideal solution to me. We would need to do some testing beyond simply installing them on a vps instance and declaring it works! !, however, I don't think there will be any huge issues with compatibility, phabricator has supported 7.1 for a full year now. @elukey, @Dzahn: do you think that setting MaxConnectionsPerChild would be worth a try? I somehow doubt it will help but it seems like it might improve the situation. The main issue is that when the deadlock occurs and the httpd process is stuck in G state it will never reach MaxConnectionsPerChild, so no hope (from my point of view) to get some relief in this case. It seem that the (only) permanent solution is to migrate to PHP 7.1.. I posted this upstream: https://discourse.phabricator-community.org/t/phabricator-processes-occasionally-segfaulting-deadlocking-since-september-2017/1142/2 - so far this hasn't generated any clues. mmodell moved this task from Follow-up/Actionables to Active Situation on the Wikimedia-Incident board. I'll look into creating a component/php71 this week. Thanks @MoritzMuehlenhoff! Please let me know if there is anything I can do to help. mmodell moved this task from Active Situation to Follow-up/Actionables on the Wikimedia-Incident board. Paladox moved this task from To Triage to Misc on the Phabricator board. Paladox added a subtask: T190568: Reimage both phab1001 and phab2001 to stretch. This happened again even with the cron that restarts it every sunday. Im not sure if we have time for codfw to get the databases setup by the end of 2018.
with the restart above, it fixed it, but it will only fill up like before. The plan is to reimage phab1001 to Stretch in T190568, unblocking the PHP 7.2 deployment that should fix both issues and get us to a normal/more-stable state. Could it be traffic? But also it could happen again. I guess that may have been the period where the rate limiter was enabled? Not quite, the timing is close but not exact. greg added subscribers: akosiaris, Zoranzoki21, • MarcoAurelio, Legoktm. Should we raise the frequency of the restarts? While merging and confirming https://gerrit.wikimedia.org/r/#/c/operations/puppet/+/476985/ which adds php-fpm support on stretch (so should not affect jessie prod yet), i noticed that /etc/apache2/mods-available/mpm_prefork.conf was changed from package defaults to custom tuned values we had set in the past. The latter changes were written in ./conf-available' as opposed to 'mods-available'. (as apache::conf class used to do it). There were 2 competing configs. Since the main config loads "mods-available" after "conf-available" the one in mods-available should have been the relevant one. That means our custom tuning config wasn't actually applied for a while. Now they are again. (hopefully) just blocked by T190568 which is blocked on T215335.